M. Night Shyamalan is a director who has run his career into the ground and now works for hire rather than creating for himself. What has he been hired on for? Most people have been complaining that this film is nothing more than Will Smith's expensive vehicle for his son, hoping to build his star level. Whether that's true or not I really don't care. I never ask what the motivation is for filmmakers when they choose to make a film, I just watch it and see how I feel about the story they are trying to tell. That story is ok. It's a father son tale in which they attempt to build a relationship, despite being separated for the majority of the runtime. Even if that was their jumping off point, it eventually became a subplot. It comes down to a futuristic disaster/survival film that maybe wishes it were more about the father son aspect. In the future Earth is lost to us. Aliens, who we never meet, stole Earth from us by releasing giant man-eating creatures who hunt by smelling the pheromones humans excrete when scared. They literally feed off of fear. To fight back, specially trained soldiers learn to hide their fear. Cypher (Will Smith) is a famous soldier considered the best of the best at hiding his fear (known as "ghosting") and taking down these gruesome alien creatures. 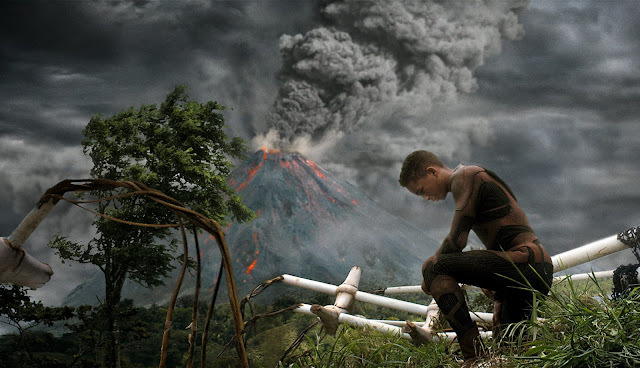 Kitai (Jaden Smith) is a young man afraid to upset his heroic father, who he probably knows best from his reputation rather than real human interaction. In the beginning, we get a lot of faces trying to reflect fear and timidness from Kitai. It stands in contrast to Cypher's no nonsense, straight faced delivery. It's like somewhere along the line they couldn't figure out how to portray a person without fear, and just decided to portray someone with no emotion at all. Even in a fight, these "ghosts" keep a straight face. Cypher, in an attempt to grow closer to his son, chooses to allow Kitai to travel with him somewhere for who knows what purpose. Along the way, their ship runs into an unexpected asteroid storm in space, and they find themselves damaged to the point of needing to land immediately. They send out distress signals that seem to go unheard, and the pilots choose to land, but that turns out to be one area of flight school they failed. Once they've crashed landed, we find that only Cypher and his son Kitai have survived. "Kitai" is Japanese for Hope, and rightfully so because, with both of Cypher's legs broken, Kitai is their only hope for survival. He must trek across the dangerous remains of Earth to another portion of their ship that crash landed, inconveniently far away, where he'll be able to send for help. This is the second film this year that is set on a post apocalyptic Earth that has been deemed uninhabitable by humans, but as far as I can tell, in both films, the planet seems fine. I'm referencing Oblivion, of course, but that film had an excuse, the people who thought earth was uninhabitable had been lied to, but here, there are clearly mammals, vegetation and other creatures that have survived. Cypher warns his son that everything on earth has evolved to kill humans, even though humans haven't been around for quite some time. Perhaps he meant to say that everything has evolved to survive while breathing air that would kill humans. Before sending him out, Cypher gives his son an armband that he can use to communicate as well as giving Cypher video of everything Kitai sees. It feels like the setup to a video game. "I can watch you and everything you do, I have radar so I'll navigate for you and warn you when there is danger, but you have to take the journey and do the fighting." This film is fairly simple. Generally we know were it's going and it's content to do what's expected of it and nothing more. Kitai is a child in his protective bubble, afraid of everything around him. He needs his bubble, and his father to protect him, but he is coming of age and wants his freedom. Worse yet, he's growing up in his father's shadow. He needs to be able to rely on himself and make his own decisions. His father, on the other hand, has spent all his life serving in the military. He hasn't been around to be the father Kitai needed. As a result, he doesn't know how to be that father. "Sometimes you have to disobey orders, even if they come from a commanding officer who gave you half of your DNA. Parent and child must ultimately separate because it's the only way to re-create themselves as equals." It's as equals that these two can form the bond they so desperately want. Only when communication is severed can Kitai learn to rely on himself and do what is necessary, and Cypher can sit back and let his son grow up. I will say the acting is pretty stiff overall, but sadly that's a sign you know you're watching an M. Night Shyamalan film. The internet is doing as it does best by overreacting with hatred toward this film. 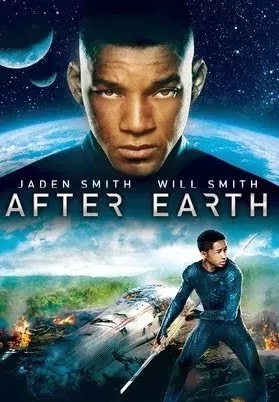 Everyone wants to call this nothing more than Will Smith's attempt to provide a shallow vehicle to take Jaden to action-stardom. I'm not saying they're wrong, but there is a little more to this film than that. If only there were just a bit more. Perhaps the only way for audiences to accept Jaden as an actor is if he does as Kitai does and separates from his father's shadow in order to pave his own way.